The Four Davids are a series of paintings, which represent 100 years of art history. 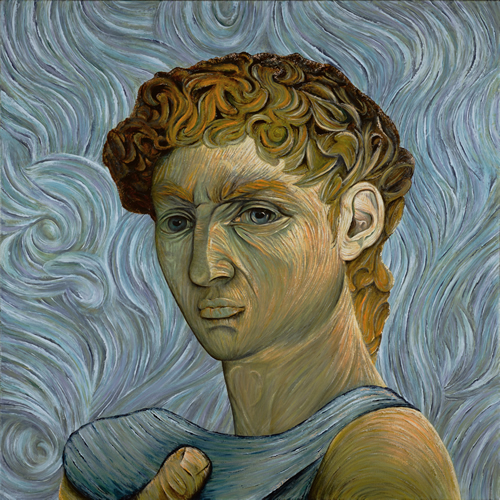 Each painting is a double homage: initially, a tribute to Michelangelo and his brilliant statue of the David and then, inspired by works from Van Gogh, Picasso, Roy Lichtenstein and Andy Warhol. Each painting is named David—followd by a year, which signifies the year of the painting of inspiration. Therefore, the paintings are named David 1889, David 1937, David 1965, and David 1984. The original paintings are each 48" x 48". The Four Davids are being offered as giclée on canvas prints in two signed and numbered editions: individually, sized 32" x 32" (limited production of 195 pieces) and all four on one canvas, sized 32" x 32" (limited production of 195 pieces).